Originally this modest Cape consisted of four small, dark rooms. While the farmhouse quality was preserved on the exterior, the interior was opened with the selective removal of walls and the addition of windows facing the rolling fields behind. To this was added, in the manner of connected farm buildings, a large open kitchen which links the house to the “barn” containing the garage and mudroom on the first level, and bedrooms and a sitting area above. 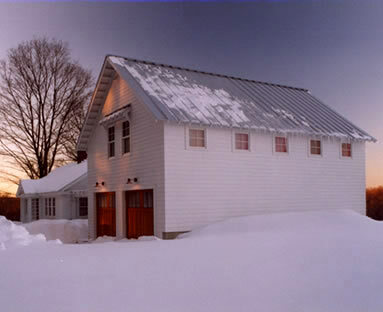 The simple white siding and trim and the galvanized metal roofing are a reference to the vernacular farms of rural New England. The interior, on the other hand, features clean contemporary materials and details in order to emphasize the owner’s collection of art.